I've always liked Korean barbecue. It's nothing like American barbecue, so put away your checkered tablecloth and set aside your handiwipes. 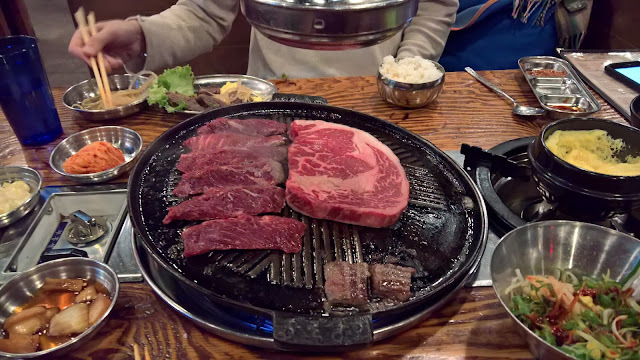 Korean barbecue is more like the love child of a steakhouse and a hibachi. The meat (pork or beef, typically) gets grilled right at the table in front of you amidst a panoply of fixings, from onions to kimchi to sprouts. Wrap your meat in lettuce and eat it like an Atkins taco or bury it in a bowl of rice and soy sauce. The joy is that you get to mix it up any way you like. Actually, I'm probably eating it completely wrong, but the food doesn't come with instructions so in my blissful ignorance I just cram it lovingly down my pie-hole and tell everyone how much fun I had doing it. Feel free to email me with the correct dining method. No, really. New York City has two hubs of Korean restaurants, and there's a Jongro BBQ in both of them. The first is in eastern Flushing (aka, Murray Hill) and the other is just off Herald Square in Koreatown (aka, north of Murray Hill). Mr Dogz and I chose the latter because, despite the throngs of tourists, it didn't require a car. Jongro BBQ is on the second floor and, arriving at 6:30pm, we waited patiently on the long line for the elevator. Taking the stairs is off limits, the elevator comfortably holds six or so people, and we were about fifteen people from the front. This was not a fast moving line. Eventually, we did get upstairs, and then got on yet another line. No reservations are taken, so we gave them a phone number and twiddled thumbs for, oh, forty minutes. Thankfully, God invented gossip, so time passed pretty quickly. 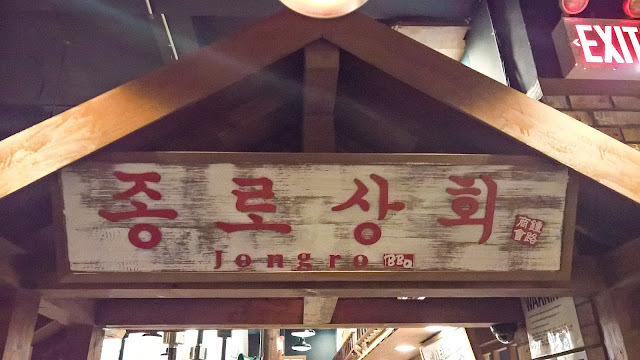 Like many Korean BBQ restaurants, Jongro is set up with lots of wooden booths and wooden beams. 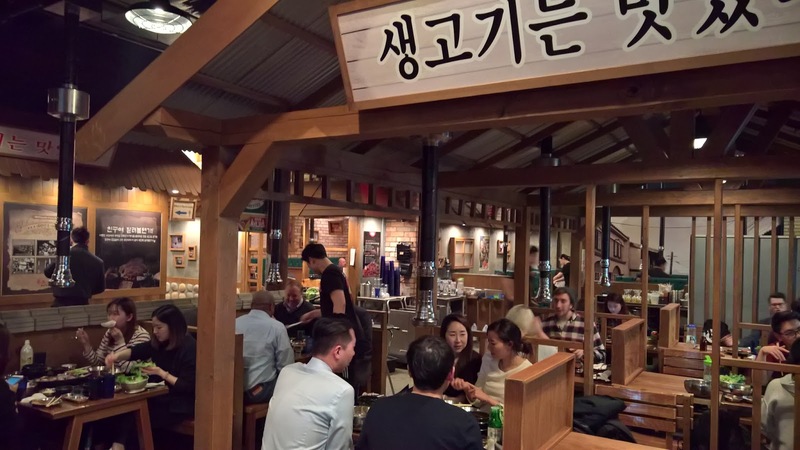 It seems that, from Montana to Seoul, steak and wood go hand in hand. It's built into our DNA to enjoy the two things together. Each table has a stove built into it where the meat is grilled. The menu consists of a platter of beef or pork, a larger platter of beef or pork, or a marinated platter of beef or pork... and there's soup. 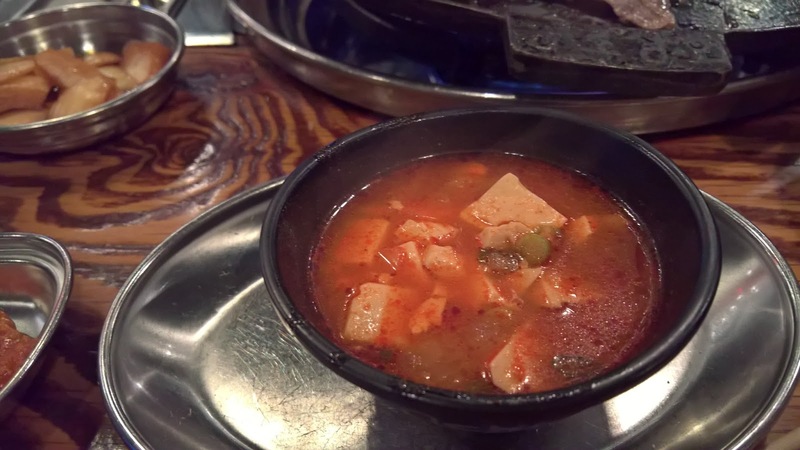 Meat meat meat... and tofu kimchi soup. 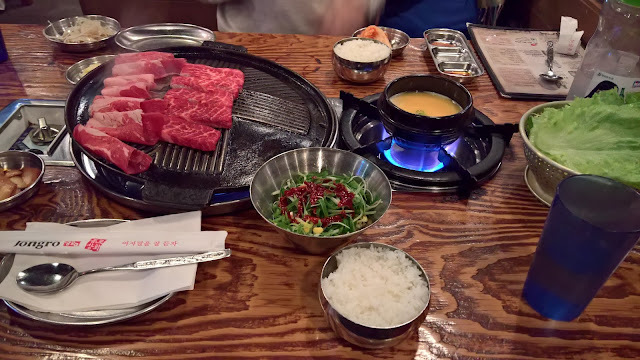 We ordered the Beef Platter, which is a selection of a few cuts of beef, along with all the goodies that you add to it once it's been cooked, plus a round of tofu kimchi soup. The soup was crazy good. I cannot stress that enough. You must get the soup. It should be sold by the gallon. Again, I don't know that I was eating anything the right way, but I felt like the waiter was giving me a "thumbs up" smile. Hey, it's possible that the waiter's approving look as I ate my lettuce wrapped cow was instead the same kind of look you would give to the dipshit who eats their pizza with a fork or the child who tries to drink soda through their nose with a straw. But ignorance is bliss and I thoroughly enjoyed my rice-kimchi-egg-sprout-beef lettuce-taco with a dash of salt. 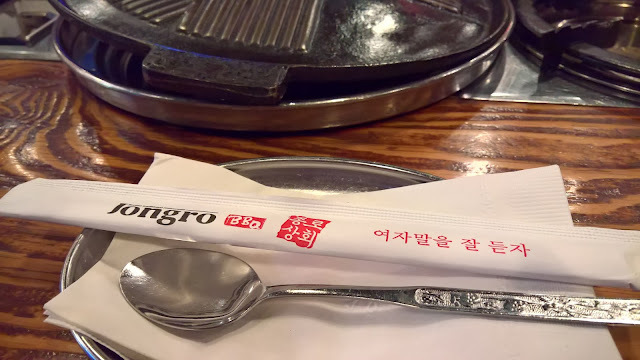 If I had to choose between Jongro and Kang Ho Dong Baekjeong in Flushing, where Dogz I went a few years back, I'd go with Kang Ho. It's less touristy, costs about the same, I feel that the meat was a little higher quality, and telling people that you went someplace with such a mouthful of a name will grant you an immediate raised eyebrow that silently states "hey, I'm impressed. You're a real pro at this eating thing." But you'll need a car. With tax and tip, and no drinks, our meal came to $55 per person.